Register 5 or more people and save $10 per person. Register 5 or more and save $5 per person. 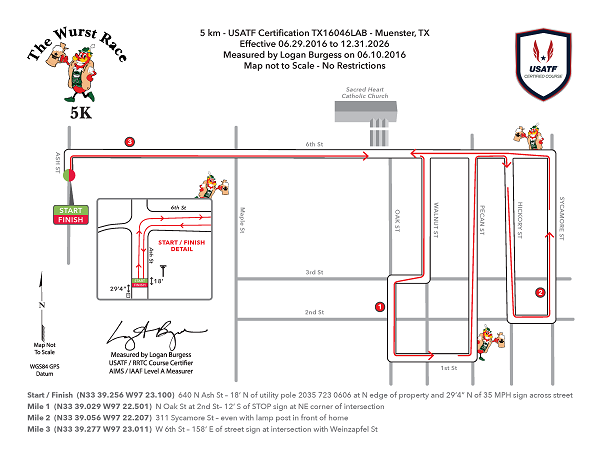 Come to the charming German town of Muenster and run the best Wurst Race in Texas! You will have the option to tackle either of our certified races at the distances of 5K or half marathon, which are both entirely on pavement. Runners will start near the heart of the community where they will encounter a lakefront view and a stretch in the scenic downtown area featuring our historic church and the Sacred Heart school building which is over 100 years old. The half marathon will continue on by the hometown baseball fields and roll into an area that is both picturesque and challenging. This is a fundraising event sponsored by the Alumni & Supporters. Inc., which exists solely for the benefit of Sacred Heart Catholic School in Muenster, Texas. It is through this organization that we work so hard to save and/or raise money to go toward reducing the cost of tuition for every child who attends our school. Funds raised are also used to assist a variety of needs including building and maintenance, textbooks and athletic expenses. Sacred Heart Catholic School is a preschool through grade 12 coeducational Catholic school, which began in April of 1890 and continues to excel today. There is a 4- hour time limit (8-12) for competitors to complete the half marathon. This isn't your traditional run, it's a 0.5k run with a full beer to the finish! Who doesn't love a little competition with a beer in hand? Whether you conquer the Wurst half marathon, the Wurst 5k earlier in the day or prefer a more laid back morning, join us immediately following the Tapping of the Keg at noon on October 6th. 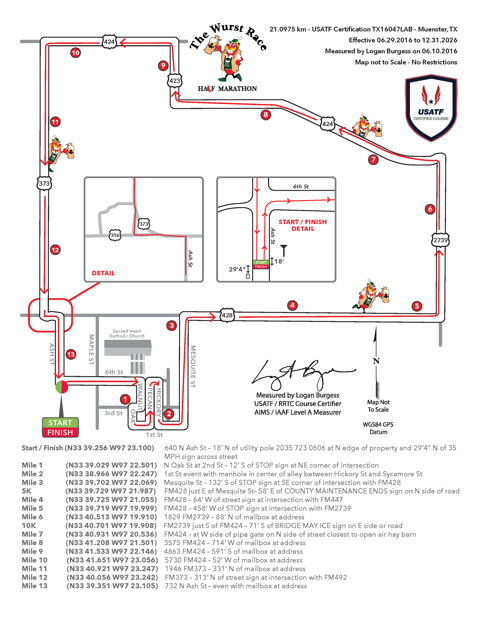 Race will be 2 'easy' loops outdoors on Oktoberfest grounds. BUT don't spill your beer, you must finish with beer above the 'spill line' to go to the final round. All participants must be 21 years of age! Runners who compete in one of the morning races receive a $5 discount, runners who do not, have the advantage of rested legs. The 0.5K Beer Run is sponsored by the Muenster Jaycees, a group committed to service in the community including, but not limited to: building and maintenance of athletic facilities in town and helping individuals in need. This year's proceeds will be donated to the Muenster Chamber. On Race Day: Bring your running shoes (or not) and your PHOTO ID. Packet pickup on Race day! Early Packet Pick up will begin on Friday October 4th from 1:00 p.m. - 7:00 p.m.
Packet Pick up the day of the race will begin at 7 a.m.
0.5K Swag Bag Event race stein; 2 beer tickets, 1 to race with and 1 to celebrate with after; Oktoberfest lanyard with bottle opener; Entry wristband for Oktoberfest. When this page loaded, the official time was 4:32:28 AM EDT.